The course takes place at the beautiful Costa Vicentina, the South-West coast of Portugal, whose impressive views and wonderful bays and beaches make a paradise for surfers, mountainbikers and hikers. The focus of this week will be on a thorough introduction into the Brazilian martial-art of Capoeira, or, when you are already more experienced in its practice, to widen and deepen your knowledge, experience and skills. Capoeira is a mixture of fight, dance, music, acrobatics, energy and body-control. Once developed by the slaves in Brazil for self-defence, this athletic martial-art has now spread all over the world. Lagos, in the Algarve, was once the first slave-market for the transatlantic slave-trade. Now, we will bring capoeira back to that cause of its existence! The combination of Capoeira and Surf is ideal, since with both activities balance, improvisation and coordinative skills are being developed. We will start the day with a Capoeira-training given to you by an experienced teacher. In the afternoon you will have the possibility to participate in a surf-course, or as an experienced surfer, just to take a board and ride some waves. Maybe you also feel like exploring this beautiful nature reserve by mountainbike or hiking, or even to climb a few cliffs? There are many possibilities to discover this impressive coastal landscape. At the end, a relaxing Yoga session will then complete your day. The week is for beginners as well as more advanced practitioners. 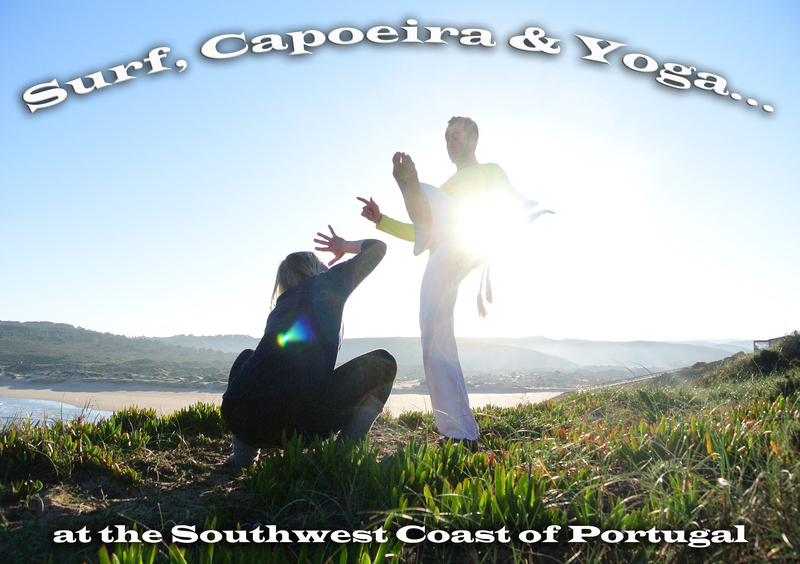 Capoeira, Surf and Yoga are activities that perfectly add to each other, and build on each other. You will be taught flexibility, coordination, general fitness and body control. As a Capoeira beginner you will learn the basic techniques and – movements in order to discover the possibilities of your own body. The goal will be to participate in a ‘roda’ and to get to know the different movement – and music styles around Capoeira. The more advanced can improve their style and skills with help of the teacher and have the possibility to take part in ‘rodas’ in the area. Certified Sport-teacher out of conviction, he comes from the Rhineland, and is one of the founders of Algarve Adventure. He is a BSA Surf-teacher, Beach Life Guard, Scuba-teacher and much more, and is with his 40 years still exited to enter the water each time anew. What else when you are a Pisces? When there are no waves, he loves to go mountainbiking. He builds his bikes up himself and likes to discover trails that are not there. The always friendly and happy 23 year old Portuguese sport-teacher from Porto is a great surfer. After ending his studies in 2013 he finally came back to us in Monte Clerigo/Arrifana, where a part of this family lives. As a successful Trampoline Acrobat this former high-performance athlete also organizes Gymnastic-lessons and adventure-games for children at the beach. Known in the world of Capoeira as professor Filósofo, the 34 year old Dutch capoeira/academic/teacher/musician/surfer from Amsterdam has taken on quite some countries and trips to deepen his knowledge in the art of Capoeira. Started in the Netherlands with mestre Marreta and being part of the school of Berimbau de Ouro, he then took the boat to Brazil where he trained and studied for some years and to where he regularly returns. Dolf has given classes to adults and children in the Netherlands, Germany, France, Switzerland and Portugal, to absolute beginners as well as to internationally renown dance-academies. Jana is a trained and certified Hatha Yoga Teacher (RYT 200), who studies and practices Yoga since many years, and has finished her teacher-training in the Anusara Yoga style. She has studied with internationally renowned Yoga-teachers from the whole world and developed a truly individual voice out of this wealth of experience, that let new as well as experienced Yogis experience the praxis with joy and lightness, and inspires them to generally feel well in their own body. Anusara ® Yoga is a modern Yoga for here and now. It connects the classic tradition of Hatha Yoga with the newest knowledge in Biomechanics and Bioenergetics. That precise alignment works therapeutic and prevents injuries. Anusara Yoga® is powerful and life-affirming. Anusara means literally „following the heart”. The point is to move, to experience oneself, to recognize one’s own potential and to live and to give form to each day. All rooms in the house have their own bathroom. You can use the large Billiards-table for a game in the communal area or kick back with a good book on the sun-terrace with ocean-view. In the evening you can also enjoy a beautiful sundown here. The beach is 5-10 minutes away by foot. 5 Day Surf-course incl. Theory-lessons. Additional overnights can be booked for an extra charge of 15 EUR in a 3-4 bed Dormitory (with bath) and 20 EUR in a double room (with bath). Massages (Sports Massage, Thai Massage) can be booked at request. Price for the whole week: 525EUR. Early bird special with booking till 15th of March 499EUR!